As we all know, technology is constantly advancing and becoming smarter to make our lives easier. So, it’s only natural that our bedrooms should also be feeling the benefit. After all, we spend around one third of our lives asleep – and the quality of our sleep impacts important aspects of our lives such as our health, performance and happiness. Essentially a smart bed uses cleverly-designed technology to help you sleep better. A smart bed gives you greater flexibility and control over your sleep position, which improves how your body is supported. 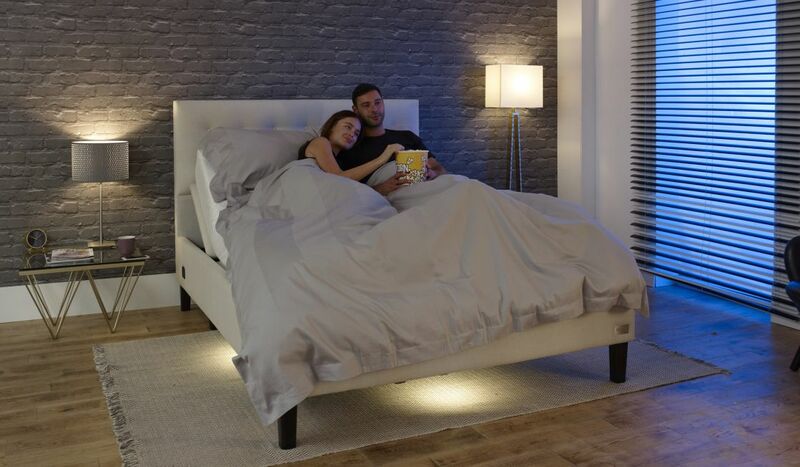 And, with dual control, you and your partner can choose different sleep positions – so you can both experience maximum comfort. A smart bed allows you to listen to what your body needs so that you can get the optimum type of support to improve your sleep quality. As a result, you can even improve your health. Being able to adjust your bed position lets you improve your sleep posture. This can help to ease back and neck pain, but it’s also a good way to address other issues that could be preventing you getting a good night’s’ sleep. If you suffer from heartburn, acid reflux or snoring, you could benefit from an elevated head and chest position to ease your symptoms. On the other hand, circulation issues and sports recovery can benefit from elevating the legs and feet. Smart beds incorporate technology that’s designed to make your life easier, including USB chargers, massage and under-bed lighting. USB charging means you can benefit from using your bed as a hassle-free charging station, keeping all your favourite bedroom technology close by. Adding massage to your bed has a number of benefits – not only does it help you relax and soothe away the stresses of the day, it also helps improve circulation, and reduces inflammation in joints. Under-bed lighting is perfect for anyone who gets up during the night – you can slip out safely, without waking your partner or blinding yourself in the glare of a lamp. Or worse, stumbling around with a phone screen as a torch. The lights often come with a handy timer function, too. One of the most important aspects of a true smart bed is being able to control it using an app. With Mode Beds, for example, our app gives you full control of both sides of your bed, both independently and together. The best part? You have the power to control your partner’s side of the bed too even while they’re sleeping – a great anti-snore bonus for those of us living with a snorer! App control also allows you to store your preferred bed positions. So, if you have a particular sleep setting that you know gives you the best night’s sleep, you can find that position at the press of a button every night. No fuss. Using sleep monitoring alongside a smart bed can help you gain an even greater understanding of how well, or badly, you’re sleeping. There are different methods of monitoring, from phones and wearables to devices that fix to your pillow or under your sheets. Sleep monitoring can help you see how well you’ve slept, including information about your movements, sleep cycles, heart and respiratory rate. It’s a great addition to a smart bed, especially with the USB charging options included. Sleep personalisation is the future of sleep and a great way to improve the overall quality of your nights. The idea that there’s one sleep position or bed shape that suits everyone is outdated. We’re all individuals with different lifestyle and sleep requirements. Having more control over your bed, at the touch of a button, can only improve your sleep quality. That’s what smart beds are designed to do.